The Thames Tideway Tunnel is an under-construction 25km tunnel running mostly under the tidal section of the River Thames through central London, which will provide capture, storage and conveyance of almost all the combined raw sewage and rainwater discharges that currently overflow into the river from 34 combined sewer overflows. Our client was a joint venture of two construction giants bidding for the 12.7km Central section to be tunnelled from Kirtling Street east to Carnwath Road (5km) and west to Chambers Wharf (7.7km). The contract also includes building eight tunnel shafts between 42m and 62m depth; six connecting tunnels; sewers; interceptors; and valve rooms. We worked with tunnelling and other experts to develop construction methodologies in response to complex bid questions. We challenged engineering approaches to ‘drill into’ the reasons why our client’s solutions were the best for the scheme. We set up engineering workshops with subject specialists – e.g. 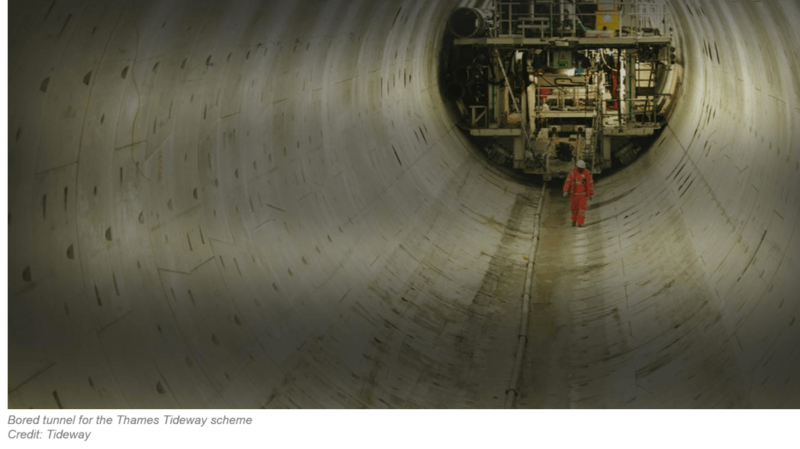 risk managers, design leaders, tunnel engineers – to review options and understand what mattered most to the client, Bazalgette Tunnel Ltd trading as Tideway. Through detailed planning of responses before writing, we were able to convey complex technical messages in ways that would make sense to a non-technical readership, as well as experienced engineers, in the assessment team. One of the challenges was that Tideway’s bid assessors were not all from engineering backgrounds, so we had to make sure that our responses were accessible to a diverse audience. This entailed ‘selling’ engineering solutions to non-technical readers, which required explanation of construction concepts without consuming too much of the allowed page count. Finding the right balance of technical and non-technical writing is one of Mercury’s specialisms. Our client’s bid was successful. At the time of writing, our client has taken delivery of two of the huge tunnel boring machines that will create the 12.7km Central section. This has been a significant milestone in our client’s success story in the Thames Tideway scheme.